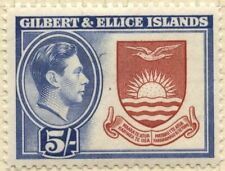 GILBERT & ELLICE ISLANDS: 1937. 1d Coronation Examples. With Full Margins. Full sheet placed under plastic sheet for photograph, possible light reflection on images. Full 10 x 6 Sheet. UK ORDINARY (UPTO £40 TOTAL) £1.00. 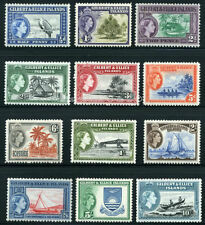 BRITISH COLONIES & TERRITORIES -------------------------------------------------------------------JUBILEE 1935 -- SILVER JUBILEE GEORGE V - OMNIBUS 1935 ---------------------- OMNIBUS SET JUBILEE 1935 -- GILBERT & ELLICE ISLANDS. The 1s stamp is hinged. Small but Good selection. Take a look. Gilbert & Ellice Island. Sheet. High cat. Direct communication is always the best way to fix an issue. AND ALL POLICIES. If there is a fault we will describe it. We appreciate your cooperation with this. Delays can occur. NEW POLICY EFFECTIVE FEB 6, 2019. KIRIBATI SG780a 2006 VICTORIA CROSS. A FINE USED SHEETLET. Direct communication is always the best way to fix an issue. AND ALL POLICIES. If there is a fault we will describe it. We appreciate your cooperation with this. Yes we can. Yes we do. We will combine over a 2 week period. 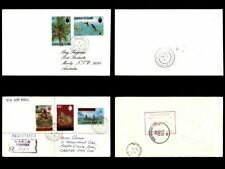 KIRIBATI SG523/6 1996 NAUTICAL HISTORY. 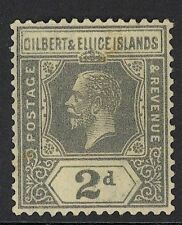 Gilbert and Ellice Islands KGV 1912-19 definitives to 1/ mint o.g. Direct communication is always the best way to fix an issue. AND ALL POLICIES. If there is a fault we will describe it. Delays can occur. We appreciate your cooperation with this. Margins / Serial numbers / color bars / gutters if imaged may be different than shown. 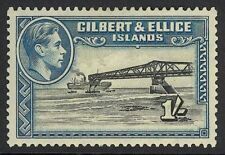 GILBERT & ELLICE ISLANDS. LIGHTLY MOUNTED MINT. 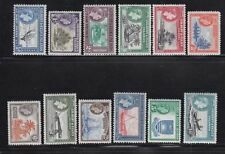 1939-55 Basic Set of 12 Values. UK ORDINARY (UPTO £40 TOTAL) £1.00. Gilbert & Ellis Is. 1956 QE II Definitives on Registered Covers to U.S.A.
WE ARE PROFESSIONAL STAMP DEALERS SINCE 1976. -NVPH (Netherlands), APHV (Germany), PTS (London), ASDA (New York), BBKPH (Belgium). Gilbert & Ellice Islands, 1949. Cover franked by Scott 41 sent from Abaiang to Tarawa. Tied by Abaiang cancels 23 AU 49. GILBERT & ELLICE, 1949. Reg Cover 41, Abaiang - Tarawa. Get a free last minute reminder! Delays can occur. We appreciate your cooperation with this. Direct communication is always the best way to fix an issue. AND ALL POLICIES. If there is a fault we will describe it. We have tried to call this out when we list a strip that has been folded. KIRIBATI SGMS347 1990 NAUTICAL HISTORY. A FINE USED MINIATURE SHEET. Scott Special ized Cat Value for MNH is 62.25. Member of the Canadian Stamp Dealers Association. Items are in. Sign up for. CHRISTMAS ISLAND, 1958. Christmas Islands, 1958. Get a free last minute reminder! (Opens a secure window. Select One or Both Alert Types ). Gilbert & Ellice Islands, 1949. Cover franked by Scott 41 sent from Marakei to Tarawa. Tied by Marakei cancels 23 SP 49. Scarce cancel. GILBERT & ELLICE, 1949. Cover 41, Marakei - Tarawa.